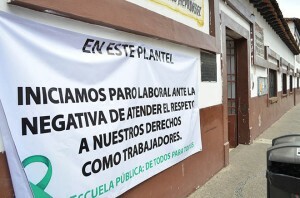 Classes have been suspended in about 150 schools in Puerto Vallarta, to join the teachers' movement against educational reform. It is estimated that approximately 27,000 students could not attend their classrooms because of the protests by the teachers with demonstrations of banners and signs. Professor Rupert Andrade Gomez, head of Municipal Education, found many schools around the city with teacher work stoppages and demonstrations which included Marine Guards on the campuses. Schools in the Pitillal area such as the Federal Secondary Aralias 29 were involved as well as the Héroes de la Patria in Emiliano Zapata (Old Town Vallarta). Andrade Gomez emphasized that the teachers are protesting the recently passed legislation by Mexican President Enrique Pena Nieto when he signed the final part the education reform bill into law on Tuesday, in a move that infuriated teaching unions who have fought the bill from the outset. This action included in the reform bill introduces mandatory teacher evaluations for the first time, which unions consider a violation of workers' rights. Because of the protests, most parents did not send their children to school on Wednesday because they had received leaflets warning the suspension of classes. Some of the schools display banners at the entrance with a message similar to "On this campus we work under protest..."